WaterFire Providence presents a full lighting on Saturday, July 14th sponsored by Fidelity Investments and the 2018 NACUFS National Conference. The lighting is scheduled to start just after sunset (8:20 p.m.) and is set to run through 12:30 a.m.
Get the July 14th, 2018 music program as a Spotify playlist. 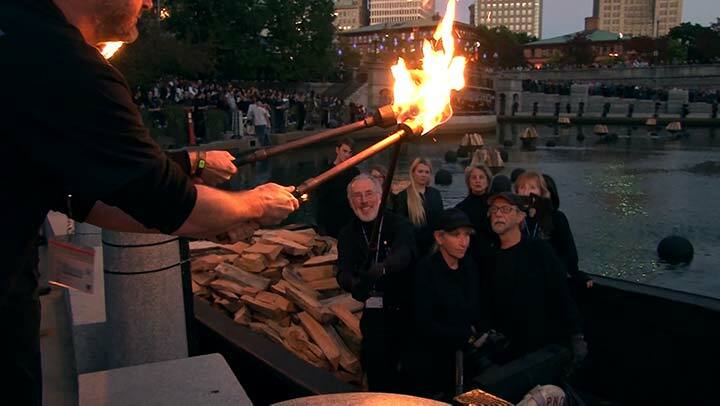 President Donald Farish of Roger Williams University receives the first light at our September 2013 WaterFire lighting. WaterFire and its Board of Directors are dedicating this Saturday’s lighting of WaterFire to honor President Donald Farish of Roger Williams University for his inspiring leadership and his transformative impact on our community and our nation. President Farish loved the University, its students and the challenges he faced in building the institution. He was an articulate and active national spokesman for the importance of higher education and the necessity of keeping college both relevant and affordable. Under Farish’s leadership, the University flourished and expanded; enlarging its spheres of engagement in many directions. WaterFire was honored to join Roger Williams University for its expansion into Providence and the 20th anniversary of the Law School with a special lighting of WaterFire in 2013. Don Farish and his wife Maia set the fires alight in the spirit of recognizing the inspiring power of enlightenment, reason, and education. Later we hosted over one hundred community design projects developed by Roger Williams students at the just-opened WaterFire Arts Center. I was particularly moved and honored to give the 2016 commencement address when I was also awarded an honorary Doctorate of Humane Letters. President Farish’s delight in seeing each student step forth into a bright new life was felt wonderfully by all of us that day. President Farish’s leadership, inspiring words and innovations in teaching at Roger Williams will bring light and engagement to generations still to come. His example of careful, thoughtful and polite civic engagement inspired leaders and the community to work together to accomplish much and is a perfect example of leadership at its finest. We will long remember President Farish and his accomplishments. We can perhaps best honor him, by seeing his as an example of the leadership we must exhibit all across this country. There is still much to accomplish.